The advances in dental technology are providing the means for more people to keep a healthy set of teeth well into later life than ever before. Improved dental care for OAPs now means that pulling a tooth at the slightest sign of infection is thankfully a thing of the past. At present, dental care for the elderly focuses more on restoration than the prevention of oral disease and there are a few rules that should be followed to ensure good dental health. More people than ever have healthy teeth well into later life but the aging process does bring about its own set of medical problems. Elderly people are more susceptible to oral disease and this can bring about further medical complications and complaints. Many people are unaware that oral disease is closely related to their overall health and if oral disease is discovered it may well be that there are also other underlying medical problems. Among the more common dental complaints for OAPs is a condition called dry mouth that occurs due to a reduction in the amount of saliva produced. Dry mouth can happen for a number or reasons with the most common being the amount and type of medication taken, it can also occur as the result of cancer treatments using radiation. Root decay occurs as the gums recede from the teeth, the roots of the teeth are then more exposed to bacteria and more susceptible to decay. After a lifetime of consuming food, drinking coffee, tea and other stain inducing liquids, OAPs will find that darkened teeth may be a problem. Darkened teeth can also be caused by changes to dentin, this is the tissue that lies beneath the tooth enamel. Gum disease caused by plaque is a major factor in tooth loss and can occur due to a variety of reasons. Poorly fitted dentures, the use of tobacco, an unhealthy diet and food left between teeth will all enhance the risk of plaque. Diseases such as diabetes and cancer will also be common sources of gum disease. If gum disease is left untreated then it can cause other medical complaints such as heart and respiratory problems. Good dental care for OAPs will take all of these problems into consideration and restorative measures by a dentist can be taken to ensure that the problems are treated and minimised. Regular dental examinations for the elderly are vital in order to ensure that any oral diseases are caught in the early stages. When you visit your dentist for an examination he will take into consideration health complications that the elderly are susceptible to. If it has been a while since your last examination then the dentist should conduct a thorough oral examination and he will also ask questions on your medical history. The dentist will ask questions regarding your general oral health particularly if there has been any recent bleeding to your gums or swellings in your mouth. During the examination the dentist will check your face, neck, lymph nodes and salivary glands; this is quite normal as he will be looking for any swellings, lumps or discolouration to the skin. The dentist will then conduct a full oral examination of your mouth, gums and teeth, looking closely for any signs of gum disease or decaying or cracked teeth. If you wear dentures the dentist will also examine these for any signs of breakage or wear. 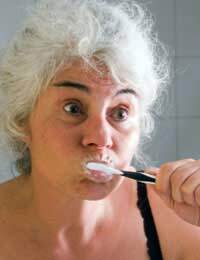 Daily dental care for OAPs should consist of a regular brushing and flossing routine. This should occur twice daily, once in the morning and before bed. Partial or full dentures should be cleaned thoroughly to ensure that no food is left on the dentures that can contribute to gum disease. If you have a problem with mobility and find it hard to visit the dentist then there are now mobile dentists who will make visits, either in your home or to your nearest residential home. The aging process does not mean that teeth should be neglected and regular dental care means many senior citizens can have a full set of healthy teeth for the duration of their lives.